Halloween is right around the corner! But there is still time to visit your local apple orchard or pumpkin patch before the brutal cold is here to stay. Being in the Midwest, it is easy to take for granted the ample amount of local food and produce grown here. For example, I never knew that an apple orchard existed around here until couple other interns pitched the idea of going apple picking one day. I am originally from the suburbs. So, being a suburbanite, the closest thing to local that I bought was labeled “local” produce at the supermarket. However, in DeKalb we have the luxury of farms and produce stands that help us ensure where we get our food from. To reiterate this point, check out the video my fellow classmate and I made to support local foods. My apple costume makes another fantastic performance! Kate Palomares with son Henry at Mighty Greens Farm. I can’t talk about local foods within mentioning fellow Dietetic Intern, Katie Palomares. Katie and her husband own an organic farm, on the border of Geneva and Elburn, called Mighty Greens Farm. Check out my chat with the Katie, below. Q: What got you into Nutrition? 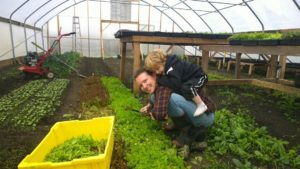 KP: I have been an organic vegetable farmer for the last seven years and I found through events in the community and Farmers Markets that people were very open with sharing their nutrition and dietary struggles with me. I did not have the knowledge or tools to help them, but I really wanted to. I decided to go back to school to become a dietitian so that I would have those skills to guide these people who are seeking help. Q: What area of nutrition do you want to focus on? KP: I am very interested in working with children and how integrating nutrition education with at-home and/or school gardens can impact their willingness to try vegetables. Q: What is a common thing people ask or say to you when you tell them you are in the process of becoming a registered dietitian? KP: “How do you have time to do that? !” Is probably the most common response that I get! So, go out and pick an apple or a pumpkin! Fall is ticking on by, so what are you waiting for? ?